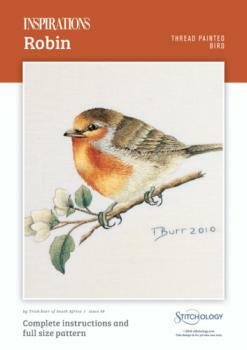 Inspirations issue 69 contained a lovely surprise: a Trish Burr bird. The project is called Robin--a deceptively simple name for an elegant study of a beautiful little bird. 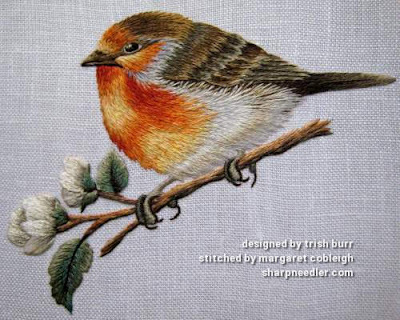 As with Trish's bluebird that I stitched earlier, I believe the source for this design is also Sherry C. Nelson. As I mentioned in the bluebird post, Ms. Nelson's works are wonderful sources for needlepainting adaptations. 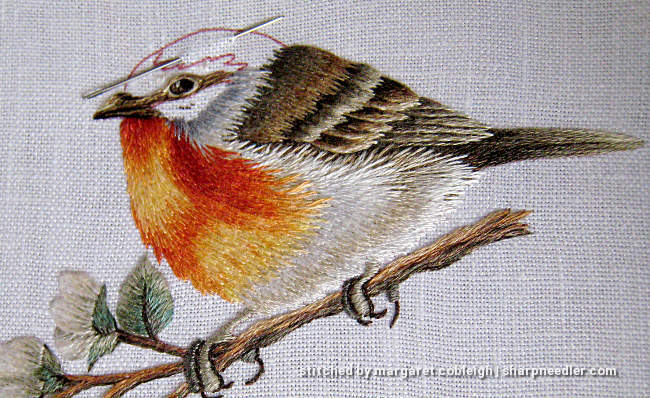 The robin is stitched in single strand DMC cotton floss. The ground fabric is the same Copeland linen (no longer available) that I used for the bluebird. I had the idea to frame these two together when they were finished and so used the same fabric. This time, I didn't overstretch the linen, but I can still see that it's a bit out of square. I'm not a huge fan of this linen for surface embroidery. In addition to being stretch-prone, it doesn't have a high enough thread count. In the close-up photos you can clearly see how open the weave is. The stitching started with branch, flowers, and feet, in that order. Then it was on to the bird's body, beginning with the tail and basically moving to the left over the body and up to the head. 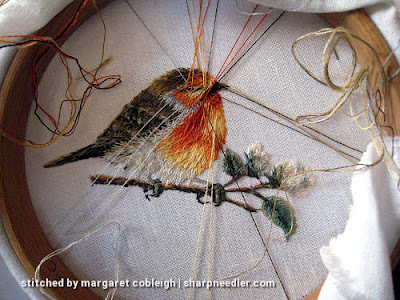 The feathers have to overlap correctly, and this determines the stitching order. 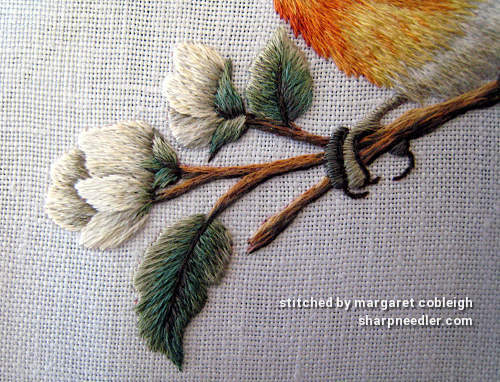 As always, Trish did a wonderful job adapting these little leaves and flowers to thread. There is only one in-progress photo of this little guy. For some unknown reason, I neglected to photo document this project in detail. 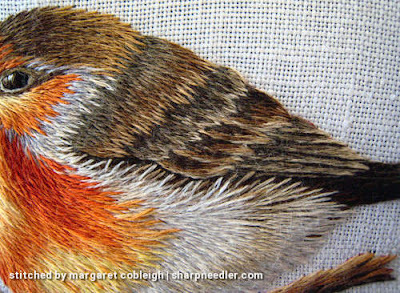 The robin was a slightly more challenging effort than the bluebird. There were a lot more colour changes. To me, the most interesting part was the back feathers. I remember working intently on getting the colours to blend, and I am pleased with the way they turned out. Since I'm an inveterate thread parker, things got a little crazy. There were times in this project where I changed colour with every stitch, so I had to keep the colours available. When I park this many threads, I slow down my stitching and make sure not to hurry. It's much easier to manage this amount of parked threads if you don't rush. He's still waiting to be framed up with his bluebird buddy. Someday, I'll get around to it. They really do make a nice pairing. 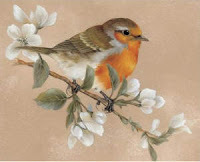 Your Robin turned out lovely! One day I might have time to make one too :). I would love to follow Trish's stitching process and learn from it. Thank you, Jessica. While there are many, many things I like about Trish's designs, I think my favourite aspect is her colour sense. I've learned a lot--I hope--by working her projects. It's changed how I approach colour in embroidery. 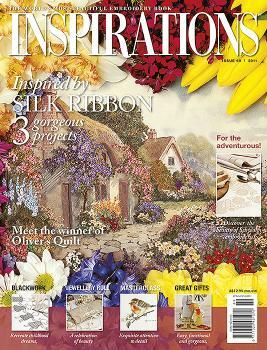 Give needlepainting a try! It's fun, but it does require practice. Your robin is beautiful! I love the shading in his feathers, although keeping that many threads going at once is something I don't think I'll ever be able to do LOL The little highlight in his eye brings the bird to life! I wouldn't recommend parking that many strands if you don't have to. I didn't actually realise how many threads were parked when I was doing the stitching. I remember turning the hoop over and being amazed that I had that many threads hanging around! 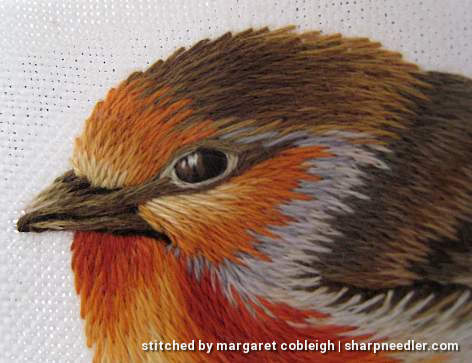 I meant to add that the eye is *everything* to me when it comes to stitching animals. If you don't get the highlight right it can mess up the entire piece. I look forward to and dread--at the same time--stitching the highlight. I haven't had any real problems with highlights, but I still have apprehension when adding one. Once the highlight is in I 'know' who the creature is. The highlight always brings the little critter to life for me. Another beautiful piece and a reminder that I perhaps should do another of her designs to learn more from her. Your note about the linen is interesting, so thank you for that. I know what you mean about needing to change thread colours regularly and having a lot on the go at once. It can get a little crazy can’t it?! Thank you, Catherine. I think Trish's designs are wonderful learning opportunities. You can stitch them as designed or use them as a starting point for adding more detail and complexity. You can't beat her colour sense. He looks lovely. You parked your threads at the back?